Situated 11 kilometres off Jaipur, the Amber Fort attracts travelers from world over. The Amber Fort is a testimony to the rich architectural style of the Rajputs. The structure of the amber fort reflects a smooth blend of the architectural styles of Hindus and the Mughals. The imposing structure was built by Raja Man Singh all in marble and red sandstone. The building was erected in the year 1592 but it was modified by successive rulers till the next 150 years. Maotha Lake present at its foreground is an addition to the charm of the structure. The rugged exterior of the Amber Fort presents a complete contrast to the beautifully done up interiors with a warm ambiance offered to its visitors. The paintings that adorn the walls of the fort depict the real nature of the erstwhile Rajput rulers. The intricate carvings and exquisite mirror work further enhance the interiors of the fort. The fort houses several massive gardens, pavilions, places and temples. Structures namely Diwan-E-Aam (hall for the public audiences), Sukh Niwas and Shila Mata Temple are quite famous. The beautiful garden Kesar Kyari adds to the charm of the fort. The most stunning creation that exists inside the Amber Fort is Sheesh Mahal (palace of mirrors). It is named so because of its design that is filled with infinite tiny mirrors all over. The Sheesh Mahal never fails to fascinate the onlookers. The mirrors are as good as the original till date. A joyride upto the fort on the back of the well-cladded elephants makes the visit more fascinating than ever. 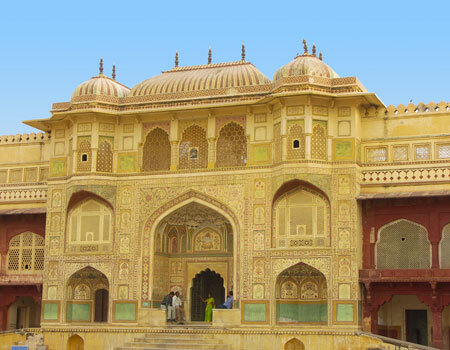 Soak yourself in the timeless beauty of Jaipur while viewing the majestic Amber Fort.